When time constraints or you’re busy around with preparing celebration meals for special occasions, like thanksgiving or Christmas, you may want to try these Swedish roast potatoes to go with the main. The fan-out potatoes with attached bottoms look a bit fancy and attractive on the serving table. This side dish only needs a few minutes of preparation. The rest of the job is done in the oven. The buttery oil made these roasted potatoes smell very aromatic and taste so good. You may want to peel the potatoes, but it’s not necessary. I used some already washed potatoes from a nearby supermarket for convenience. I don’t even scrub them, just rinse them instead. The flesh of the potatoes is soft and tender with crispy outside after roasting. Wash the potatoes and pat dry. Peel if desired. 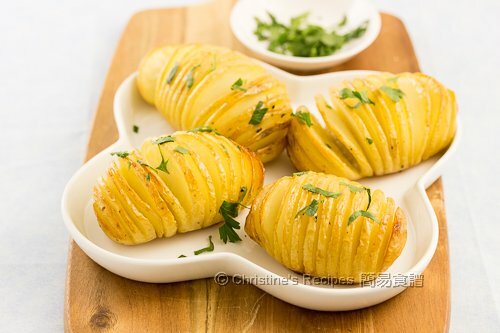 Trim a thin slice off of the bottom of the potato in order to prevent it from rolling around. Use a sharp knife to cut slits into it evenly at 0.3 cm intervals, stopping before cutting through and let the bottom stay connected. 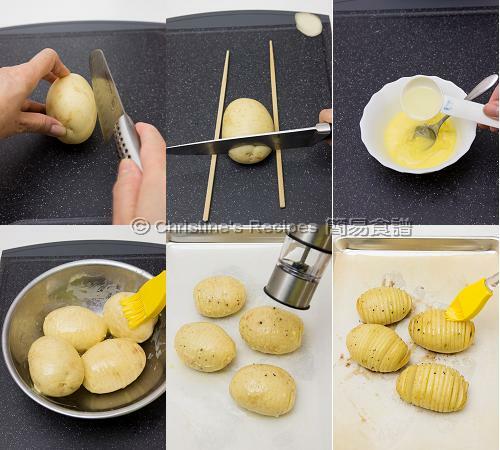 By putting two chopsticks next to both sides of the potato, then you'll know when to stop slicing. Repeat with remaining potatoes. Mix melted butter with olive oil well. Brush half of it on to the potatoes. Let some drip into the slits. Place potatoes onto a lined baking pan. Season with salt and pepper. Bake in the pre-heated oven for about 35 minutes. Carefully remove from oven. Drizzle with the remaining butter mixture. Bake for another 20 minutes. Sprinkle parsley for garnish. Serve hot. The result will be better if the potatoes are baked with skin. Washed potatoes are available at supermarkets. The baking time depends on how big the potatoes are. Adjust the cooking time accordingly. The amount of butter and oil can be adjusted according to your liking. The more butter you use, the more aromatic and delicious your baked potatoes will be. And the butter and oil will help prevent them from drying during baking. You can use any oil you like. I used olive oil. Sea salt is best for making this dish. You may use table salt instead. 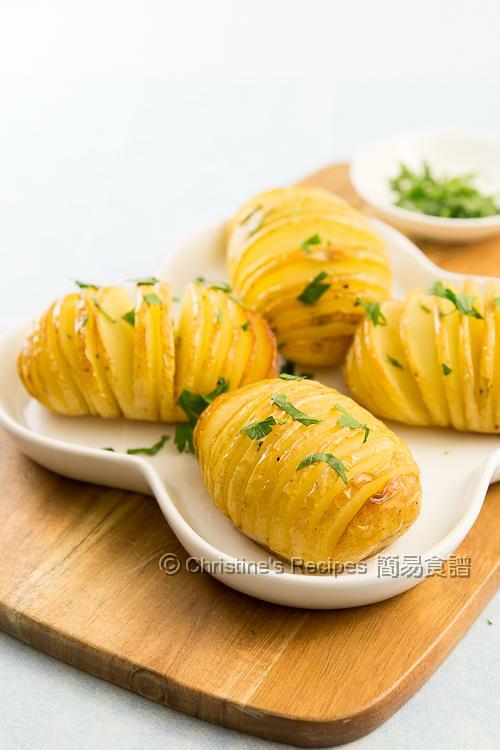 I haven't made or had hasselback potatoes in ages...now you have me crave some, Christine. Glad that you liked this dish. Every oven is designed quite different. Feel free to adjust the temperature and baking time.